Whenever a hailstorm rips through the Nashville area, homeowners are faced with a great deal of stress and worry. This is, of course, because hailstorms can cause serious damage to your roof. Performing necessary roof repairs after a hailstorm is critical to the functionality of your roof and the comfort of your home. As your go-to Nashville roofing company, we would like to share with you some things to keep in mind next time a hailstorm hits Nashville. Sure, we all know what hail is, but do we really understand how it forms? Let’s take a look. Hail is a form of precipitation that forms when upward air currents carry raindrops into the upper level of clouds where temperatures are below freezing. When sent upward, the small raindrops get surrounded by ice and then drop, picking up more moisture on the fall. However, depending on their size, the hailstones can actually be brought back up again if they get caught in another updraft, which can cause more freezing and even larger hailstones. Eventually, when the updrafts cease, or when the hailstones grow so large that gravity can’t keep them lofted, they will sink. 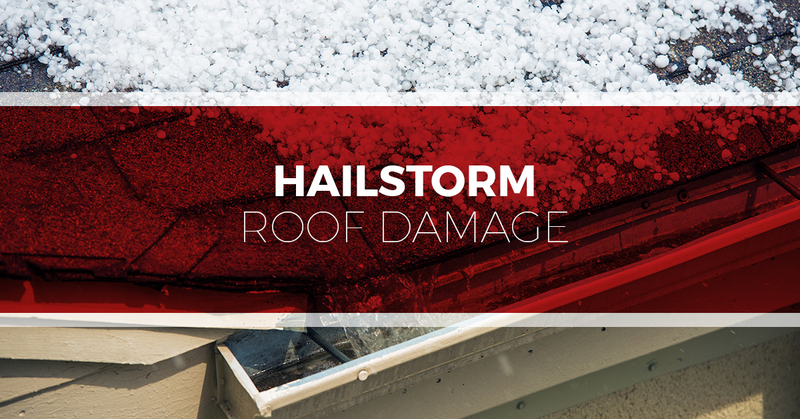 Depending on the size and density of the hail, your roof can experience a number of problems, many of which could leave you vulnerable to leaks and other costly issues. Because of this potential concern, it is important to perform a thorough roof inspection after a hailstorm and document any problems. What Are The Signs Of Hail Damage? Hail-caused roof damage can be hard to spot from the ground. Therefore, following a hailstorm, you can’t solely base your assessment on stepping outside, looking up at the roof, and carrying on with your day. Rather, it is important to climb up on your roof and do a close and thorough inspection. If you do not have the experience to perform this inspection, it is crucial to have a professional roofing contractor or home inspector come and take a look at your roof. This being said, you can assess the damage by looking around at other areas of the house. Oftentimes, if these areas show signs of damage, your roof is likely in need of repairs. Dented gutters — when a roof has significant hail damage, the tops of the gutters will also often have some impact damage. Damaged siding and window sills — check out all the window sills and casings, and look for any dings, dents, or other signs of damage. Dented air conditioners — if you spot dents and damage on your air conditioner, this can not only indicate that your roof may also be damaged, but it also might mean that your air conditioner has been damaged, which may qualify for a replacement through your insurance. Any time you work with roofing contractors, especially after a hailstorm, it is important to properly vet your contractors. In addition to confirming that they are licensed, it can also be helpful to read reviews and get a second or third opinion. With the detailed estimate, also request a general time-frame for the proposed work. Receiving this information will ensure that you partner with the right roofing company. What If I Spot Damage? If you notice that your home has been damaged by hail, it is important to do a few key things to make sure that your damage will be covered under your insurance policy. Step 3 — Fix any issues that pose an immediate or emergent threat. This may require calling an emergency roof repairman or contractor. Step 4 — Contact a roofing company or contractor to schedule a roof inspection. Step 5 — Call your insurance company to file your claim. Does Tim Leeper Roofing Provide Claims Assistance? Yes, we do. In an effort to make your roof repairs as hassle-free as possible, we provide claims assistance. This means that we will help guide you through the roofing-repair-insurance maze, and we will deal with your insurance company directly to expedite the process. We also offer emergency roof repairs. Contact us today to learn more or to schedule any of our commercial or residential roofing services.